Schema.org + WordPress – Is it possible to fully add it? Haven’t even heard about Schema.org? Schema.org is out there since June 2011. It was launched by Google, Bing and Yahoo to create and support a common set of schemas for structured data markup on web pages. The purpose is to add microdata to HTML elements to provide more information about itself. I guess since then Google worked on their “Rich Snippets” system. But what about schema.org in WordPress? Is it possible to integrated it there? Why not using hcard, RDFa or other microformats? There are a lot of microformat-standards out there, that’s right. But Google explicitly wrote on their Webmaster Tools Support Sites that they decided to focus on schema.org in the future. The thing is that it can be attached to nearly any element. Even “Facebooks Open Graph (…) doesn’t provide the detailed information search engines need to improve the user experience”, they wrote. But this doesn’t really explain what the page is for (or even what it does). When we add schema.org microdata it will look like this. This now tells the search engines even more. In this case: the current page is a blog! (Yes, there is a difference between a normal webpage and a blog page!). What about Schema.org in WordPress? Schema.org did not found its way to the WordPress community yet. They have added hcard information before but it seems very incomplete. That’s why a lot of WordPress installations generate the popular “Missing required field “entry-title”. Warning: Missing required field ‘updated'” or anything else on Googles Rich Snippet Testing Tool. By the way: this is also the reason why rich snippet do not work on those pages. If there is only one error Google will not show rich snippets on search results for those pages. Therefore, we should not rely on hcard information that has been integrated in WordPress at this point. As I found out, Google rely on schema.org in the future. 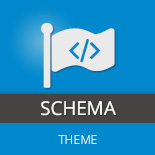 Instead you should use a theme which fully supports the schema.org microdata. For example the schema.org Corporate WordPress theme. It adds a lot of microdata to nearly every single HTML element on your blog. Why not using any schema.org WordPress plugin? The thing is that there are schema.org plugins out there (like the Rich Snippets WordPress plugin) but they cannot add schema.org to every single HTML element of your blog. By using this plugins you have to add Rich Snippets manually to every single page. Technically it’s just not possible that a plugin adds schema.org automatically. In fact, WordPress themes has to do this for you. In the theme files you can specify things like the header-example from above. I wrote a blogpost named “Google Tools now showing structured data on my WordPress Theme” earlier this year. And the results were amazing. I’ve updated the post a few times now and it get’s even better. On the right you can see the current picture what’s going on on Webmaster Tools. More importantly, the use of Rich Snippets can make your web pages appear more prominently in search results, so you may see an increase in traffic. In my opinion it’s not only about the Rich Snippets that look really good on your search results. It’s also about the fact that search engines can learn more about the structure of your website which makes crawling more efficient. I’m sure that in the near future, schema.org markup will be a fixed part of search engine optimization.